Autosomal dominant polycystic kidney disease (ADPKD) is the most common hereditary renal cystic disease. Majority of families with ADPKD have an abnormality on chromosome 16 (PKD1 locus) resulting in end stage renal disease at a mean age of 54.3 years. The diagnosis and management of ADPKD relies primarily on imaging studies. Renal ultrasonography is commonly utilized to screen family members for ADPKD . The ultrasonographic criteria for the diagnosis of ADPKD for at risk individuals are age dependent. Individuals aged 40 -59 years with two cysts in each kidney on ultrasonography is associated with a sensitivity and specificity of 90 and 100% respectively. CT scan (Fig. 1) imaging is more sensitive than ultrasonography and can identify cysts with a diameter of 2-3mm. 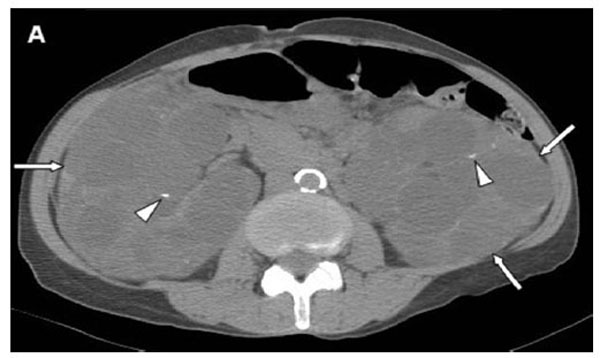 Axial noncontrast CT scan showing enlarged bilateral kidneys (arrows) with multiple cysts of variable sizes. Some of the cysts have partial rim calcifications (arrowheads). Coronal T2 weighted MRI image showing marked enlargement of both kidneys (arrows) spanning nearly the entire length of abdomen, right kidney is 25 cm in length (volume 1230ml) and left kidney is 24 cm in length (volume 980ml). the right renal volume as 1230 ml and the left renal volume as 980 ml. MRI imaging and renal volume estimation is still considered a research tool but can assist in providing insights into rate of progression of renal disease. Early studies with tolvaptan have shown reduction in total kidney volume with slowing of the decline in renal function over a 3-year period . Katabathina VS, Kota G, Dasyam AK, et al. 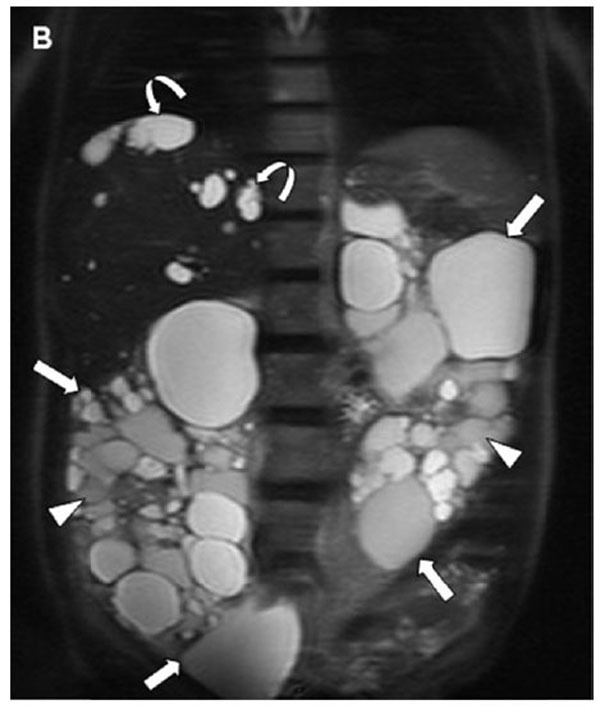 Adult renal cystic disease: A genetic,biological, and developmental primer Radiographics 2010; 30: 1509-23. Chapman AB, Bost JE, Torres VE, et al. Kidney volume and functional outcomes in autosomal dominant polycystic kidney disease Clin J Am Soc Nephrol 2012; 7: 479. Cheong B, Muthupillai R, Rubin MF, Flamm SD. Normal values for renal length and volume as measured by magnetic resonance imaging Clin J Am Soc Nephrol 2007; 2: 38-45.